The first real post on Banana Stew was this one about the gas mileage of a 1997 Ford Explorer. It's still one of the more popular posts, based on page views. 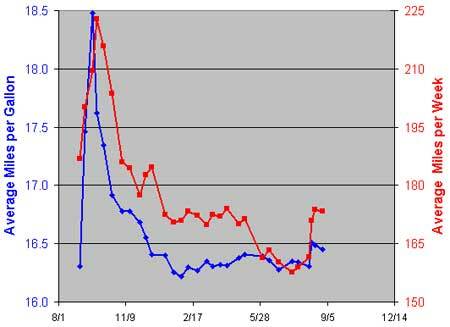 In light of the recent upswing in gasoline prices, and since it's been quite a while since that last post, it's time for an updated analysis. Here's the data: miles per gallon and miles per week as a running average. The overall average is 16.5 miles per gallon and 173 miles per week driven. Unlike last time I'll avoid putting in the average dollars per gallon, as those numbers are changing daily and are quite depressing. So, should I now trade in my Explorer for a zippy hybrid? Let the numbers do the talking. I've analyzed two different hybrid models - the low-end Toyota Prius 2-door and the much more desirable Acura 4-door. Based on Kelly Blue Book, here are the stats. The trade-in value on my Explorer is (generously) about $6000. The price for used hybrids is the same as for new ones, so I've used the new prices. 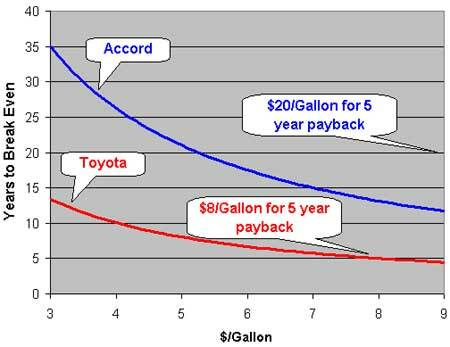 At the current level of about $3.50 per gallon, it would take 11 years to break even on a Prius and 30 years to break even on an Accord. If I want to break even in the timeframe of a typical car loan (5 years), gas would have to reach $8/gallon for the Prius and $20/gallon for the Accord. Yes, $3.50 gas is awful. I'm spending much more at the gas pump than I'd like to. I'm making changes in my spending habits as a result. I would love to have a little hybrid in the garage instead of the Explorer. But as bad as it is, the numbers still don't add up for trading cars. I still plan to ride the Explorer into the ground and consider a small car next time. Unless, of course, you'd like to buy me one.